Hard to believe that two years have gone by since I started the blog. In a strange twist of fate, this is also my 200th blog (if my math is correct). So it is time for a give-away. Your part in this? Just leave a comment on this post by midnight, Tuesday, May 4. Optional: tell about an exciting moment you have had in quilting. Or, if you don't quilt, just something you'd like to share. Or just say whatever you want--you will still be in the drawing. The prize is yet to be determined, but I don't think anyone will be disappointed. Let me just take a moment to say thank you to all who have commented over the past two years. I know that many people "lurk" and that is fine--but the comments help me to know someone is out there reading. There are times when the posts just flow, and others where I am struggling with what to say--or not to say. Just like in most of our lives! I have decided not to worry about whether the posts are quilt-related, or about knitting, or horses--or who knows what I'll be into next. 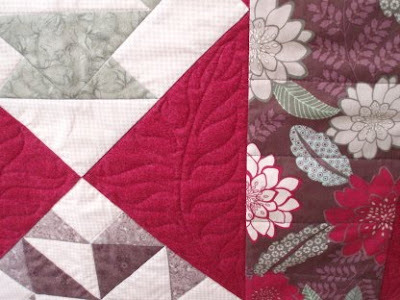 As someone reminded me recently, on the "masthead" it says "News and views on quilting and the world at large from one very opinionated quilter". When I started the blog, I could not have predicted what a winding road I would now be traveling. But I wouldn't take back one step of the journey. One of my favorite quotes (I'm not sure who said it) is: "Well-behaved women seldom make history." 'Nuf said. Big hugs to each and every one of you! I had some Blue Suede Shoes paint left from the parlor/hall/stairwell and decided it was a perfect complement to pink brushes. Here's Lynnie inspecting the job. The stuff in the bottom is the non-slip matting one can use on shelves or between plates to prevent scratches or damage. Lynnie makes a great inspector! 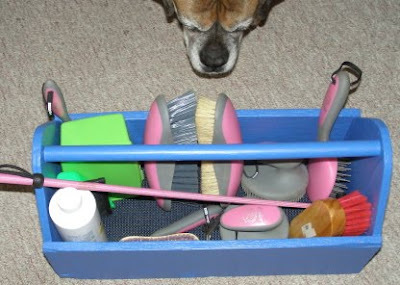 Here's the box filled with my brushes and other accouterments. 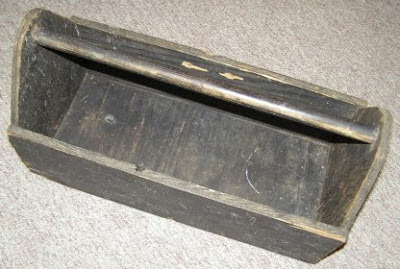 The tool box story is continued further down. The first of this week, Electra's owner and I had a saddle fitting--trying to find the best saddle for both Electra and me. And the correct stirrup length, a girth that fit Electra.... You get the drift. I brought the saddle home to clean it. This is what it looked like before I started. And this is what it looked like when I was done! OOOOHHHHH, shiny! That is one of the safety stirrups peaking out and the leather girth. 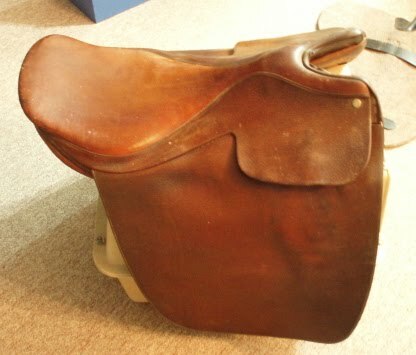 This is the cutback saddle I was talking about a couple posts ago--the one with nothing to hang onto! 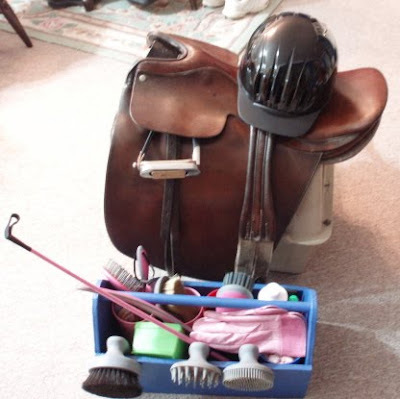 I was just looking at the last picture and thinking how much horse stuff I have for someone who doesn't own a horse! How did that happen? 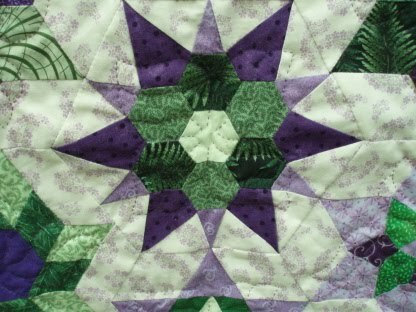 (I'm fairly suspicious that quilting started this way too--dip in a toe and next thing you are caught in the undertow!) As an aside, we finally figured that Electra had not been ridden or driven in at least 12 years! So I think we both did really well. Okay, enough horsing around for a bit (I really do try to keep it to a minimum on the blog). I am dangerously close to my 200th post--which means????? We have had beautiful spring weather here in Central New York for a few weeks now. I've mowed the lawn once. So imagine my surprise and dismay to find it snowing when I got up this morning. And it looks like we may get hard frost tonight. 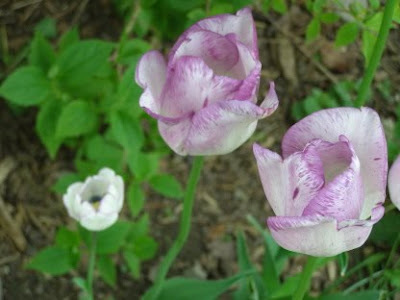 It just figures when trees are budded out and the bleeding hearts are full of blossoms. On the bright side--it can't last too long. Today was spent tidying up at home, washing my grooming tools, doing laundry and ironing, spending time with Callie and Lynnie and talking with my best friend. So a cold, blustery day was a blessing in disguise. I am reading the last time I saw you by Elizabeth Berg, and it is wonderful. Listening to 29 Gifts--How a Month of Giving Can Change Your Life by Cami Walker. It makes you calmer just to listen and it is a fabulous concept. Off to do a few more things before bed. But wanted you to know I was thinking of you. You know how some things are just too weird--and you think how they couldn't possibly be true? Well that's how this month has been. I was really excited to blog about some really cool stuff--when my laptop got stuck in a reboot loop--turning itself on and off every three minutes. Took it to the shop (an hour away) and they kept it for several days and I just got it back today. The unfortunate news is that the period key is not working correctly, so I have to stop and hit it several times to get it to work once. Anyone have any ideas how to fix it? I have taken the key off and spritzed with canned air but nothing is working. I will give the shop a call in the morning and see what they have to say. 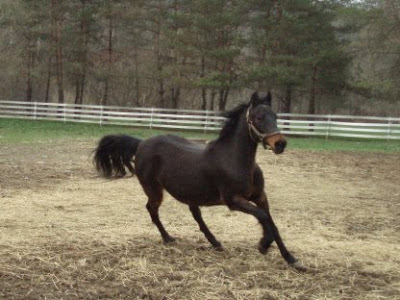 In the meantime--see this fabulous horse? 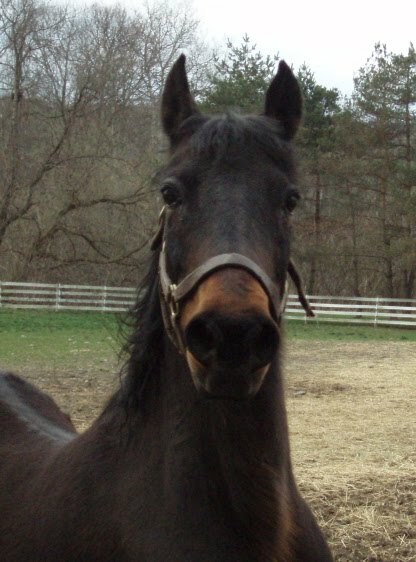 Yes, it's Electra, the 25-year old mare. And guess what? I rode her for the first time last Friday! She was so pleased to be working--she literally floated on air and pranced every step of the way The good news? I actually stayed on! We only walked, but her walk is very animated and she was ready to goooooooooooo! Unfortunately, she had me, a person who has not ridden in over 30 years! A good thing to remember? 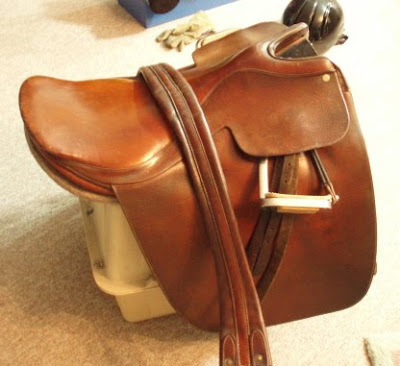 A cutback English saddle has absolutely NOTHING to hold onto! Today we fitted her with a saddle that fits both her and me a bit better and I have safety stirrups (just in case). And, yes, I was wearing a hard hat--next up is body armor! No pictures of me riding--too busy holding on and Electra is not happy with anything resembling a camera and definitely nothing to do with flash. She is something else! She's also the one with the beautiful tail. Sorry, Diane...I had meant to put you up before the horse pictures, but this loading of pictures in reverse of how you choose them threw me off tonight! Lack of practice this month, I guess! 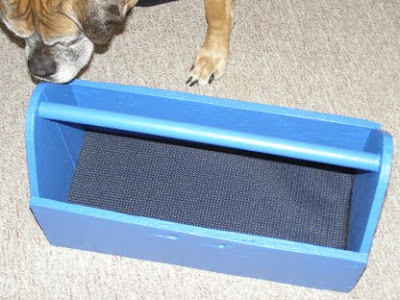 Anyway, you've seen pictures of Diane's finished projects before on this blog, and you will not be disappointed here. 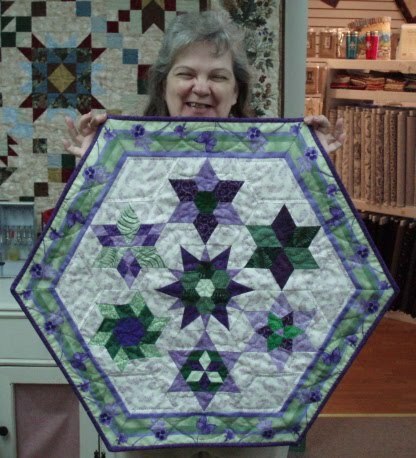 Diane took the Hexagon Bliss class last year and just finished her piece--totally finished--bound, hand pieced and hand quilted. Here's a close-up of the center block. The fabric selections were superb, and check out how accurate the piecing is. Great job, Diane! Last Tuesday I was to present a lecture to the Thumbstall Quilt Guild in Marcellus, New York. I packed the quilts, dressed up in my fancy "going to lecture" clothes and took off for the about an hour trip. I got about 10 miles from home, slowed down for a registration/inspection check and then started accelerating again. I got about two car lengths when there was this funny (funny weird, not funny ha ha) noise; I pulled into a car wash parking lot and got out to look. After a careful search, I found that the serpentine belt (the thing that controls EVERYTHING) was fraying and hitting on everything. I tried to pull off the frays, but it was pretty much a lost cause. So I had to call my mom and ask to borrow the car! Needless to say, I was about 10 minutes late to the lecture and my beloved Jeep never made it home that night--the flapping belt had cut a radiator hose and caused overheating. So on Wednesday morning, my brother and I had to fix the hose and the serpentine belt in parking lots to get the Jeep home. The ladies of the guild were most gracious and I appreciate their warm welcome and good humor! Okay, that's probably enough for tonight. It's very annoying to type with no period key! 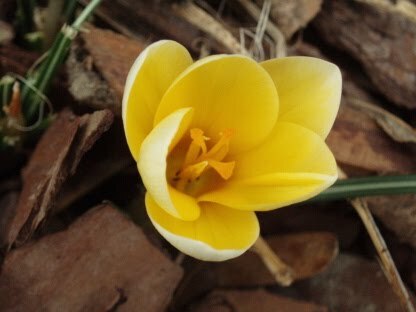 Are you all remembering how special you are? These are trying times we are in--so let's celebrate the special in each of us. Last year I taught a machine pieced block of the month at Pucky Huddle Delight in Candor, New York. 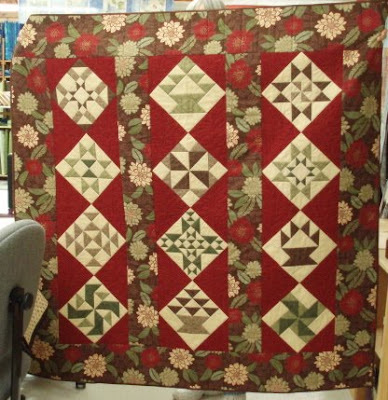 Nancy C. recently brought her finished quilts in for me to see, and she agreed that I could share them with you. First is the 12 block class project. 8 inch blocks, set into vertical rows. Nancy has a wonderful eye for color and fabric. Here is a detail of the quilting in the setting triangles. And look at those points! 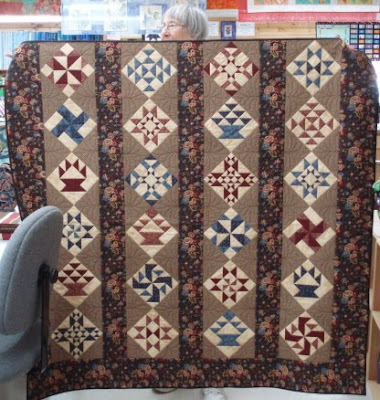 At the same time, Nancy made 24 six-inch blocks and set them on point in vertical rows. Nancy favors an old-fashioned look and frequently leaves off the top and/or bottom borders to achieve that. Interestingly, both quilts are approximately the same size! Great job, Nancy--you rock! My BFF Cindy has been immortalized in the next picture. She is taking her last seam in the flannel quilt we started in 1999, I think! 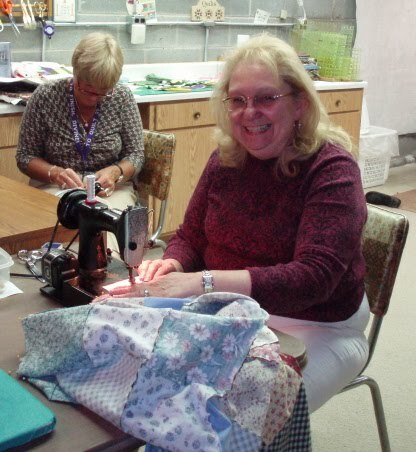 Debbie (to the left in the picture and also a BFF) cracked the whip and refused to let Cindy talk--she had to SEW! And sew she did! Not too bad--about 10 years from start to finished top! You go, girl! Love you lots! I have been horsing around, quilting like a mad woman, teaching classes, trying to spend some quality time with my Dyson (okay, mostly I am cleaning my horse grooming tools, but still...). What I am reading: A Thread of Truth by Marie Bostwick, and listening to The Charlemagne Pursuit by Steve Berry. Happy belated Easter to those who celebrate that holiday. Soon it will be Memorial Day--where can I get off this tilt-a-whirl?